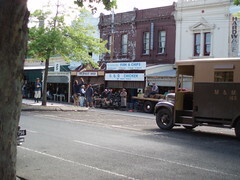 OK, nothing too exciting happens in Carlton North so when they transform parts of it into a film set, everyone gets excited. On the way to work, I took some pictures from the set of The Pacific. 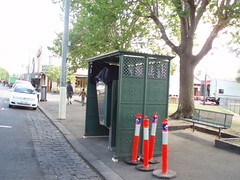 They transformed Rathdowne Street to look like post WWII Melbourne. 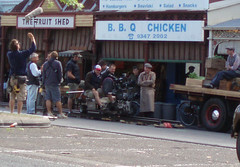 The guy with the white hat on is an actor playing a policeman. 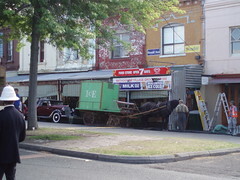 The scene took place outside The Fruit Shed. Soldiers and women in 1940s attire were filmed picking out fruit. In the picture to the left, you can see Director Tim Van Patten. 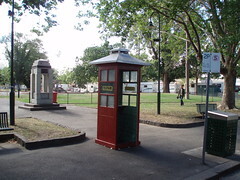 An old style phone booth that was set up and on the right covering up a new style phone booth. I managed to get a small video before my camera battery died. The set is open and they will let you walk through and tell you nicely when to get out of the shot. Definitely worth a look. 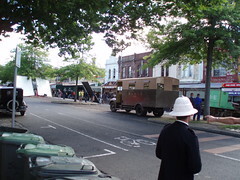 We saw one of their film units around the Abbotsford Convent on Saturday, with crew vehicles taking up quite a bit of the parking, much to the chagrin of the patrons of Collingwood Childrens’ Farm Farmers Market. A friend of ours has also been up to his elbows helping them build bomb craters and war fields around the You Yangs.